To help you find the Best Dog DNA Testing, TopConsumerReviews.com provides you with an in-depth comparison of Embark and Live Well Testing. Embark takes science to a whole new level when it comes to DNA Dog Testing. Created by Ryan and Adam Boyko over ten years ago, this company takes a deep love of dogs and combines it with cutting-edge research around the globe to help owners give their canine companions the best possible care. Embark has partnered with the Cornell University College of Veterinary Medicine, National Geographic, the National Science Foundation and many others to study dogs on every inhabitable continent, in more than 40 different countries. Although it's not the cheapest test on the market, Embark's Comprehensive Dog DNA Test is exactly that: extremely detailed. While some of their competitors only look at approximately 10,000 genetic markers, the Embark test looks at more than 200,000. Your dog will be tested for more than 160 diseases and a dozen traits. Best of all, as new discoveries are made and tests are added, your dog's profile will be updated automatically at no cost to you whenever possible. Note - some new tests require probes; in that case, you would need to buy a new kit to get the updated information added to your pet's profile. Dog Breeds: the test covers 250+ breeds, including village dog, dingo, wolf, and coyote (!). 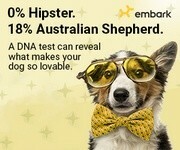 More than 98% of the dogs in the US will be covered by the ancestry results of the Embark test. Health Conditions and Disorders: Embark screens for 165+ genetic health conditions and continues to add to their database as research progresses. Some of the tested conditions include Muscular Dystrophy, Dysplasia, Narcolepsy, and Glaucoma. Traits: you'll be able to find out a dozen trait characteristics, such as coat color and other features, body size, genetic diversity, and performance. Your results will be easy to understand: they come as an interactive guide that you can access on your computer, tablet or phone, and you can even share a Vet Report with your veterinarian. The Embark test costs $199 for the regular comprehensive Dog DNA test, and $179 for the test specific to breeders. When we visited the site, we were given a $20 discount off our first order if we entered our email address. You can also get a discount for ordering more than one kit at a time: 10% on two kits, 15% on three kits, and 20% on four or more - so it might be worth it to see if your friends are also interested in finding out more about their furry friends. You do have to ship all of the kits to a single address to get the multiple kit discount. Customers have extremely positive things to say about the experience with Embark. They report in-depth results, helpful customer service representatives, and very thorough screening that comes with every test. You can expect to receive your DNA test results back anywhere from 3-7 weeks. Most customer reviews we found mentioned an average of 6 weeks from the time they sent the DNA kit back to Embark until they received the test results for their dog. If you're looking to get information on your dog's ancestrygenetic health predispositions, and trait characteristics, Embark is the dog DNA test for you. For their comprehensive testing and top quality results, they earn our highest rating.Embark is the go-to company for the most comprehensive DNA testing currently available for your dog. They earn our highest rating as the best dog DNA Testing available today.